Today I would like to introduce to you two of the most important trends of minimalist style design. How do we create a great room? Disposing of partitions separating different rooms and making one great Room. Which is the advantage of an open kitchen layout? The picture shows the before and after of a minimalist great room transformation in a Florida vacation home for a European young family. The mother wanted to supervise the kids when she was working in the kitchen. For this purpose we demolished the wall that divided the main area from the kitchen and decided for an open kitchen layout. I designed a home office hidden behind a double door in the floor-to-ceiling cabinetry area, with a roll-up shutter to hide clutter. To hide the appliances, we designed an appliance garage over the one level great island. I would like communicate with you through this blog. I love every aspect of my job; I am really blessed! For more than thirty years I have specialized in designing and building luxury interiors for affluent clients, mainly residential, new construction and remodeling. Most of my clients are busy people and world travelers who most of the times are out of town during the design and construction process, when many of the decisions are made. I have to say that one of my most gratifying moments is looking at my clients’ faces when they see the finished product for the first time. They express their pride and satisfaction in many wonderful ways; sometimes they are overwhelmed and cry, sometimes they organize big celebration parties. My pride is to have most of my clients of many years as repeat clients; I greatly value their trust and respect. They become part of my circle of family and friends. Another part of my job that I deeply enjoy is mentoring Interior Architecture students; guiding them through their learning and decision-making process and sharing with them my hands-on experience is something that I find wonderful and enriching. The brief of the project was to develop a 16,000 square foot Georgian Style residence in a country club community in Pilar, Buenos Aires, to suit our client, a couple who likes to entertain and that would use this residence during Buenos Aires winter weekends. The commission involved the architectural, interior architecture, and interior design projects, the selection of the art & antiques, the accessories and fine objects, the supervision of the landscape design, the project management and the construction supervision. Plans for the 16,000 square foot winter residence were so large, that the Country Club ordered to divide the residence in two buildings- a main residence with the maids quarters and a facility for an indoor swimming pool, two locker rooms with hot tub saunas, a huge game room, a dining room, a kitchen, a large “Argentinean” barbecue area, and the residence’s caretakers apartment. Our design respected Georgian style principles, recommending the use of mosaic tiles for the indoor swimming pool-England during the Georgian period had discovered Pompeii. Our project also added some French touches to please our client’s wife, such as the custom-made wrought iron staircase and front door, with gold accents, details that remind her of her condo in the XVI arrondissement in Paris. 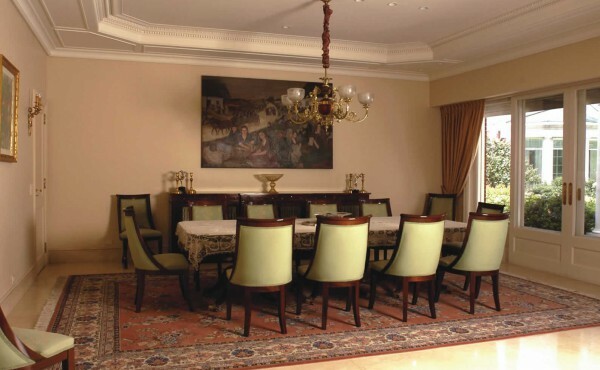 Our design also integrated the family’s important art and antiques collection. Korn Interior Design was hired to do the Interior Architecture, the Interior Design, the Construction and the Project Management for this exclusive 15,000 square foot penthouse on two floors plus rooftop in one of Buenos Aires’ best neighborhoods “Palermo”. This penthouse has stunning views of the River Plate, the Rosedal Park, the Palermo Racetrack, and the Palermo Polo Fields. 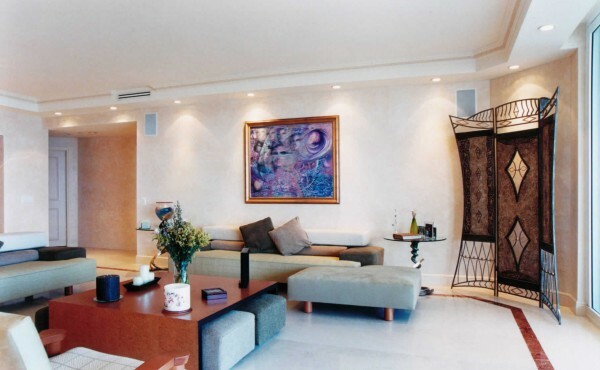 Our vision for our client, Gabriela Sabatini, an Argentinean tennis champion and her family was to completely modify the floor plan, adding new rooms, and areas, modernizing and improving the flow and functionality of this penthouse triplex. This was achieved through an extensive exercise of stripping out and demolition work throughout 100% of the existent apartment, to ultimately create a sumptuous, sophisticated and luxurious apartment with Classical, Deco and Modernist influences. The penthouse has expansive reception areas, a formal dining room,a family dining room, a bar, a double living room area, a winter garden with custom-built two-tone-marble arcades hiding the perimeter window frames, a media room, three master bedroom suites, two guest bedroom-en-suite, a gymnasium, a home office, a solarium-spa with custom-built marble arcades and a sliding transparent dome roof, a huge eat-in-kitchen,a laundry room, and double maid quarters. The design scheme benefits from exclusive marble and granite floorings and walls, “Versailles” designed wooden parquet floors, custom designed “vitraux”, exotic wood paneling, all seamlessly integrated with custom designed furniture, special ceiling treatments, an intelligent lighting project, and cutting edge technology. Additional highlights include a gorgeous bespoke staircase with floating black granite steps and a bronze handrail, as well as custom painted “trompe-l’oeil” murals, and engraved glass walls. 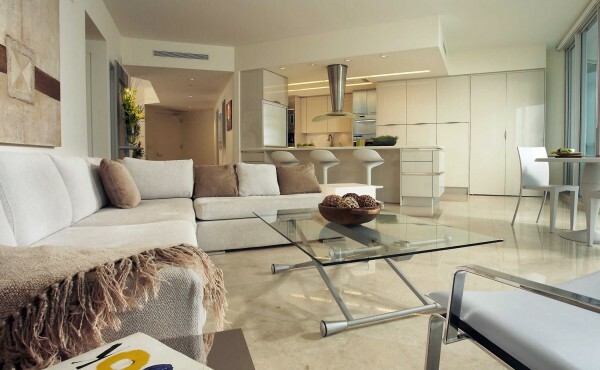 The brief of this Sunny Isles Beach vacation residence for an international family was to transform a traditional condo layout into an open space plan, comfortable for a family with young children while at the same time suitable as an entertaining space. 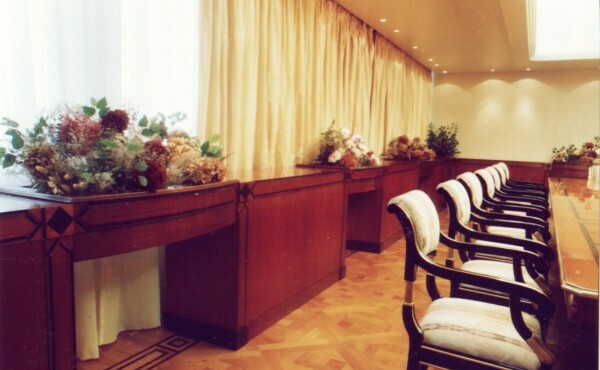 Our design also integrated the family’s growing art collection. The wife wanted to see her small children while she worked in the kitchen and living/dining room area. The husband wanted to have a small work space connected to the kitchen. This was achieved through an extensive exercise of stripping out and demolition work to ultimately create a luxurious open space. 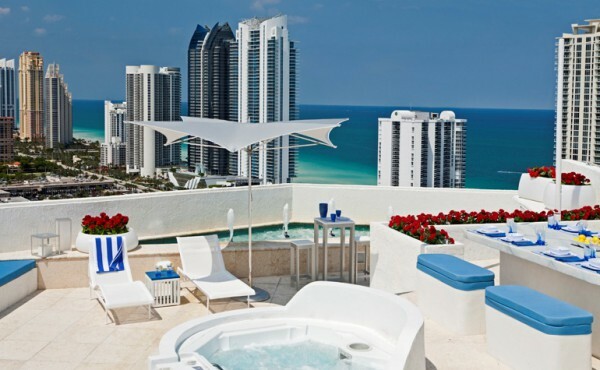 Korn Interior Design, Inc. was inspired by our client’s Euro-minimalist aesthetic for this 7,000-square-foot penthouse triplex in Sunny Isles Beach, Florida, with 270 degrees wrap-around balconies in two levels, and a 1,500-square-foot rooftop, with views of the ocean, the Intracoastal waterways, and downtown Miami & Ft. Lauderdale. Our team worked from the pre-construction stages with the building architects andthe developer to ultimately create a luxurious open floor plan layout, very different to the original developer’s proposal. The large main living floor seamlessly blends several ‘functional areas’; a large open kitchen, a bar/entertainment station, dining area and a lounge/TV theater – each ‘delineated’ by direct or indirect lighting and/or architectural elements such as the barrel ceiling in the theater and various wall and ceiling soffits. The design is ultra contemporary with clean lines, sleek surfaces and lack of clutter. Using an exceptional selection of materials, architectural elements,dramatic lighting effects, and the latest technology, our team created a magnificent space which reflects an understated minimalist luxury aesthetic, in an interplay of comfort, modernity and elegance.